A couple of weeks ago, I was sitting in Toopi, fixing a smartphone holder to the window pane with a boy in front of an automotive accessories shop. When the phone rang, I was irritated because I am like that. I get annoyed with things like that. “Is it Smitha?” the person asked. “Hmm, yes,” I said, distracted, and indicating to the boy to fix the holder a little more to the left. “This is Chetana from Sunday Herald. I wanted to let you know that you have won the first prize in the DH Short Story Contest.” Me, still gesturing to the boy. “Oh, is it? That’s nice,” I say. Probably the singlemost underwhelming response the editor must have received. It was after I kept the phone that I stared at what I had heard in disbelief. I was dazed. Had that really happened? The first time I enter a writing contest and someone is telling me I won the first prize? And then, I picked up the phone and dialed the first person I wanted to share the news with – the person who sat with me and edited my story, the person who believes in me more than I do – the person without who I am just hollow, and the greatest supporter of my little writing – I called my friend. 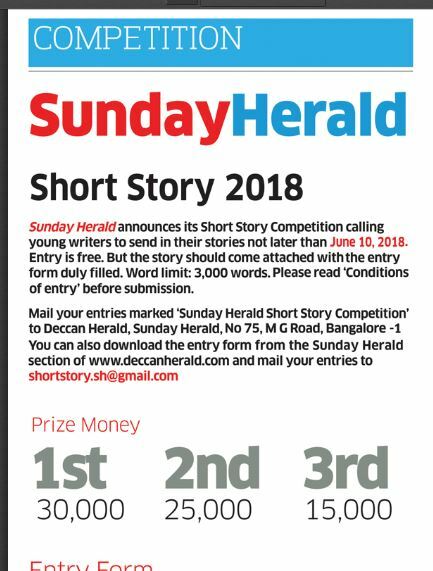 The Sunday Herald Short Story Contest is an annual contest that invited entries for short stories with an entry limit of 3,000 words. The writers should be residents of Karnataka, and between the age of 17 and 50. (Why the age limit of 50?). I sent in the short story, ‘Meeting Old Age,’ which I had originally written on paper during a writing workshop session last year. During that workshop, I was given a prompt, and this was the story that had flown during that time. I modified that same story. Find out here and more here. I am not here to crow about it. No. Not at all. I am sharing to express gratitude. One of my greatest motivations to write comes from you, my reader – when you tell me that something I wrote here resonated with you or it made your day better – I write more. Every time you read this blog, you make me stretch that one word more. I want to say “Thank You,” to you for taking the time to read with all my heart. There was a time when I was in school when an English teacher pulled my hair, and asked me to write something for a UNESCO essay competition. I didn’t. I didn’t believe I was good enough. And then, there was a time when a friend, VT, took little stories I had been writing to our English professor then in Jyoti Nivas College. She was the second person who believed in my stories – without her doing that, I doubt I would have written anything anymore for the rest of my life. Thank you, VT. 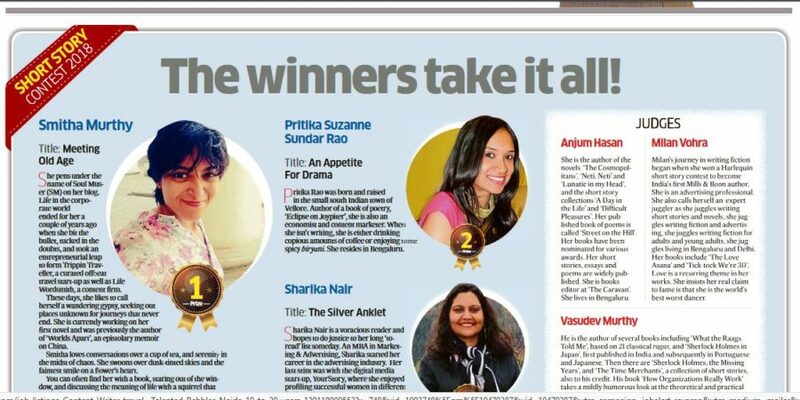 I am thankful to the judges who felt there was some potential in my story. Thank you. And I want to express my gratitude to you – Birdy. My incredible soul connection. If you hadn’t pushed me for the past 14 years, I wouldn’t have taken the steps to push the trembling insides of my self, and scratch my soul out raw for this world to read. You have asked me many times in the past to send something across to magazines, and I always refused. I was too shy and too lacking in confidence. I sent it to DH this time because I so loved bringing that joy to your face when you realized I am taking my writing a bit more seriously and giving it a bit more love. You have patiently read everything I write. Everything. You edit what I write. You reread. Again and again. You spend hours honing my craft. You hunt down publishers for that book of short stories I penned more than seven years ago. You push me to continue writing on that novel I have been stuck with. You are an incredible source of meaning, joy, annoyance, irritation, hurt, beauty, kindness, love, and strength in my life. I wouldn’t have it any other way. This prize is for you. Always you. Have read so many short stories that were published in SH but this is the first time I liked it to the core that it pushed me to write this comment. Enjoyed reading “Meeting old age”. The wit and humor in it kept me glued to it from start to finish. My aunt also has been using walking stick and she has been advised to use it because of knee pain. She loved your story as well. I laughed at the sentence where the Doctor says “This pain in the knee is old age”. This exactly is the same sentence the Doctor told my aunt 😀 and I could relate to every bit of story you have written. And I rolled with laughter reading your description about the skeleton in the Doctor’s room whose limb was askew :D. Keep up the good work. I was just now reading about your passion for reading and writing. I love reading books but not read as many as you. And writing poetry is one of my hobbies.And yeah now I want to read the book you have co-authored ‘Worlds Apart”. Thanks so much for your reply. 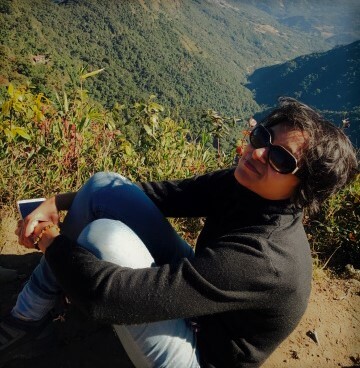 Its a pleasure reading your blog. Thank you for expressing interest in reading my poems. I have mailed a few of them to your email id. Thanks Sheetal. Awww, that poor Dodo – please ask him to look at a flower again. I wouldn’t be writing at all if it weren’t for you. :-D. You anger me to write and you, grin, also motivate me to write. Congratulations! Look forward to reading the winning story. Thank you so much Sampath for your kind words. Previous Post Can I Do It?